For a generation and more, the contribution of Christian theology to interreligious understanding has been a subject of debate. Some think of theological perspectives are of themselves inherently too narrow to support interreligious learning, and argue for an approach that is neutral or, on a more popular level, grounded simply open-minded direct experience. In response, comparative theology argues that theology, as faith seeking understanding, offers a vital perspective and a way of advancing interreligious dialogue, aided rather than hindered by commitments; theological perspectives can both complement and step beyond the study of religions by methods detached and merely neutral. Thus comparative theology has been successful in persuading many that interreligious learning from one faith perspective to another is both possible and worthwhile, and so the work of comparative theology has become more recognized and established globally. With this success there has come to the fore new challenges regarding method: How does one do comparative theological work in a way that is theologically grounded, genuinely open to learning from the other, sophisticated in pursuing comparisons, and fruitful on both the academic and practical levels? How To Do Comparative Theology therefore contributes to the maturation of method in the field of comparative theological studies, learning across religious borders, by bringing together essays drawing on different Christian traditions of learning, Judaism and Islam, Hinduism and Buddhism, the wisdom of senior scholars, and also insights from a younger generation of scholars who have studied theology and religion in new ways, and are more attuned to the language of the "spiritual but not religious." The essays in this volume show great diversity in method, and also-over and again and from many angles-coherence in intent, a commitment to one learning from the other, and a confidence that one's home tradition benefits from fair and unhampered learning from other and very different spiritual and religious traditions. 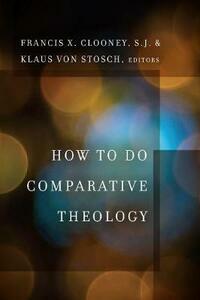 It therefore shows the diversity and coherence of comparative theology as an emerging discipline today.